Young Athletes™ is an innovative sports play program for children with intellectual disabilities, designed to introduce them to the world of sports prior to Special Olympics eligibility at age 8. The pilot has been implemented thanks to the generous support of the Mattel Children’s Foundation. The Young Athletes program strengthens physical development and self-esteem for children ages 2 through 7 by building skills for future sports participation and socialization. Family members and caregivers also are encouraged to become involved as the child learns success through physical activity. 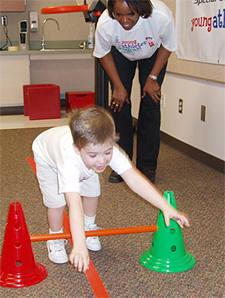 Level 1 includes physical activities focused on developing fundamental motor tracking and eye-hand coordination play. Level 2 concentrates on the application of Level 1 physical activities through a sports skills activity program. Level 2 also focuses on developing skills consistent with Special Olympics official sports. Special Olympics is conducting this pilot phase of Young Athletes; it began in 2005 and will continue through early 2006. The pilot project is currently being evaluated by Special Olympics researchers and preliminary findings will be presented at the 2006 Special Olympics USA National Games in Ames, Iowa in July, 2006. Following the presentation of findings and subsequent adjustments of the program, Young Athletes will be made available to Special Olympics Programs throughout the world in the second half of 2006. These resources, as well as funding opportunities, will be made available in the second half of 2006. 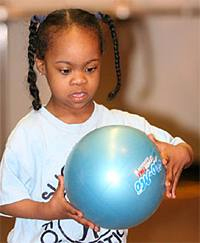 “The support of the Mattel Children’s Foundation and Mattel employees globally will not only help grow the Special Olympics movement to reach more of the 180 million people with intellectual disabilities worldwide, but also help us create a world of acceptance for Special Olympics athletes,” said Timothy Shriver, Special Olympics Chairman. See more information about the Young Athletes pilot program and a list of pilot participants. For more information, contact Ben Daniels, Global Manager, Family & Young Athletes, at bdaniels@specialolympics.org.